Ian Kennedy Martin, the man who wrote the groundbreaking TV series, was younger sibling of Troy Kennedy Martin. Troy, born in Rothesay, Scotland, was the man who gave us cinematic favourites The Italian Job and Kelly’s Heroes, along with such small-screen delights as Z-Cars. Clearly, when Ian began making Redcap, a 1964 TV series starring a fresh-faced young John Thaw as a military police special investigations officer, he had a lot to live up to. It’s fair to say that when he realised how good the 22-year-old Thaw was and created The Sweeney around him, he was on to a winner to rival anything Troy did. The Sweeney first hit our screens almost a decade after Redcap’s end, but it was just the job for a mass British audience. It would last four series and over 50 episodes, with well over a quarter-of-a-million quid spent on each episode. For that kind of dosh, we got car chases, shoot-outs, hard-drinking coppers taking no nonsense from gangsters or demanding girlfriends, and it really would have the PC brigade up in arms for so many reasons today. Even back then, though, it was shocking, for its scenes of violence, bad language and deliberate lack of glamour. When thugs wearing tights over their heads leapt out of vans, or vans of equally terrifying Flying Squad – “Sweeney Todd” – officers did likewise, you could almost smell the fear and aggression. Thaw, of course, was Detective Inspector Jack Regan, and Dennis Waterman his sidekick Detective Sergeant George Carter. From the start of 1975 to the end of 1978 – its original release dates – it had us glued to our screens every week, and many of us tended to view the police in a very different light. Thames Television, who brought us it, had hit a rich seam, and it made the old favourites like Dixon Of Dock Green seem cosy and friendly in comparison. This was all booze and sweat, knuckledusters and truncheons, a world where the hardmen got sorted out by equally fearsome goodies, and The Sweeney surely put several thousand young viewers off a potential life of crime. It just looked too scary if these coppers caught you. This month, the two feature films spawned by the TV hit are being released on high definition Blu-ray and DVD, and Sweeney and Sweeney 2 will be manna from heaven for fans of the show. For a younger generation, they will be a mind-blowing first taste of what was an astonishing TV hit in its Seventies heyday. Sweeney, which came out in 1977, featured our hardbitten anti-heroes getting caught up in a political plot, a suspicious death at its heart. The follow-up, Sweeney 2, saw Denholm Elliott co-star, in a tale of bank robbers creating mayhem around the streets of London. The reason that even real cops were intrigued by The Sweeney was because it’s a warts ’n’ all depiction – Regan and Carter are real, make mistakes, bend the rules, behave in a very naughty fashion every chance they get. When they go head-to-head with the brutal ganglords who try to rule London, they behave in a likewise manner, and such old-fashioned ideas as “You don’t kick a man when he’s down” never come into it. Real police officers loved the realism of it all, and it was actually created during what was a bad spell for the real Flying Squad. Drawn into legal battles and newspaper stories of bribery, corruption and accusations that they were too close to the criminals they were supposed to hate, it wasn’t a good time to be a member of the Flying Squad. So The Sweeney was timely, too, and you can bet plenty of hardened criminals revelled in every minute of it as well. The wonderful Garfield Morgan played Regan and Carter’s boss, a thankless task, and he was perfect as Detective Chief Inspector Frank Haskins. Shot around Notting Hill, Fulham, Hammersmith, Acton and Shepherd’s Bush, you can only imagine the sheer terror of turning a corner during filming and finding one of The Sweeney’s gruesome fight scenes taking place before your eyes. They made nine books based around it, too, and Ray Winstone was star of the 2012 film version, while there has been everything from comic strips to mentions in songs by Squeeze and Kate Bush. Spoof TV adverts, too, have featured pretend Regans and Carters, but of course nothing rivals the real thing. John Thaw, sadly, died at just 60 in 2002. Dennis Waterman is 70 now, and most recently has been known for New Tricks, where he played Gerry “Last Man” Standing. The Flying Squad wouldn’t have thanked Regan and Carter for their portrayal of surveillance officers using supposed British Telecom tents, there to cover manholes but actually for the cops to observe any suspects. This was a real Scotland Yard technique, which they had to stop using after Regan and Carter showed it on telly! 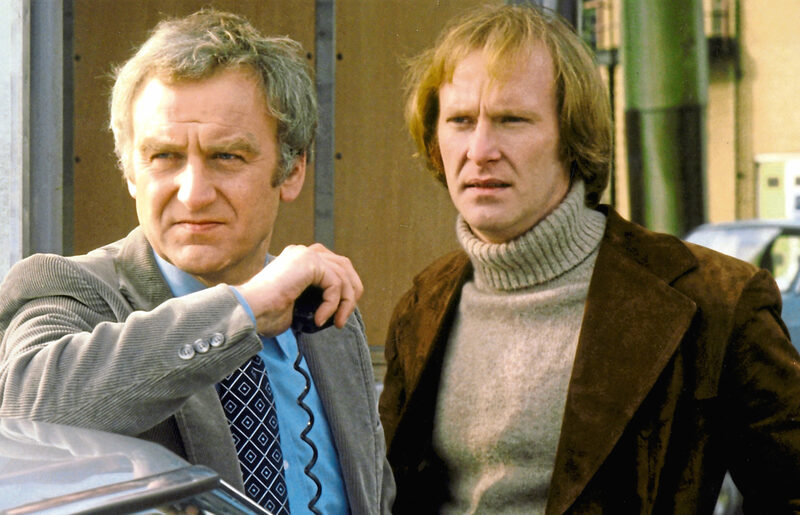 Even Robert de Niro and Al Pacino would have thought twice about taking on this pair, and The Sweeney really did cause a revolution in TV cop shows. You can buy Sweeney and Sweeney 2, £17.99 for the Blu-ray, £12.99 for DVD, on Amazon. They are released on Network’s The British Film label.